We have put together a number of presentations and offer them to any community groups on request. In cooperation with the Antigo High School Cable News team we have also recorded some of these as DVD's which are available for viewing. Eventually all presentations will be available on DVD. Each DVD is about 20 minutes long. When the Kraft Cheese Co. built its plant in Antigo in 1922 the Kraft family were so taken with the area that they bought land on Enterprise Lake near Elcho and built vacation homes there. A staff of five gardeners maintained six acres of gardens that were open to the public. From 1938 to 1953 the gardens were open to the public and were a major tourist destination. 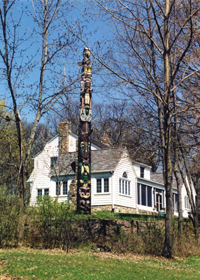 From the first structure in what would become Antigo, built in 1879, (the Deleglise cabin) to the mid twentieth century a number of land-marks are still present as a reminder of how Antigo developed. Houses, businesses, parks and infrastructure reflect the growth of Antigo. 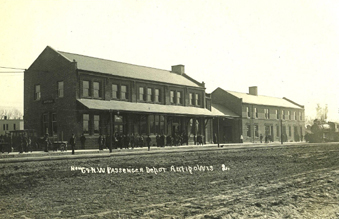 The Antigo depot was expanded in 1905. It was the expansion of the railroad into northern Wisconsin that connected Anti-go to other parts of the state. From 1905 to the mid 1950's Antigo was headquarters to the northern division of the Chicago and Northwestern Railway, which was a major employer in Antigo. The dense pine forests are what first attracted white settlers to the area. 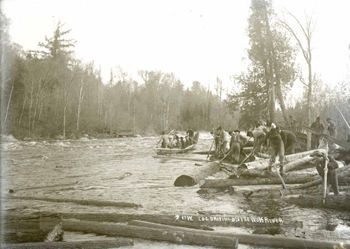 Initially logging occured near the Wolf River so that logs could be floated downstream to market. With the coming of the railroad logging expanded to other parts of the county. Often short spur lines were built to logging camps. Once an area was cut down the tracks would be taken up and reused, going to new camps. Beads were introduced by Europeans to American Indi-ans who readily adapted this new material into their thriving decorative arts that used shells, antlers, bones and porcupine quills. Similarities in materials and styles suggest vast networks of trading and cultural influences. 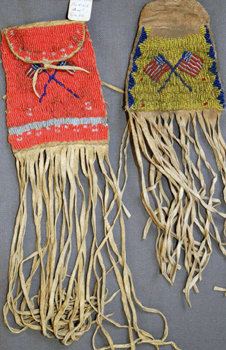 Tobacco pouches (right) with the American flag were done by Plains Indians while bandolier bags were an art form developed by the Woodland or Great Lakes Indians. 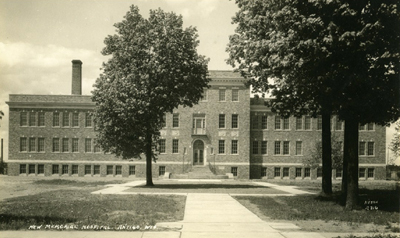 Long before Langlade Memorial Hospital opened in 1933 there were individual practices and three private hospitals in what were once family homes. The construction of the hospital in 1933, its expansion in 1954, and the establishment of the clinic in 1993 are all stages in the ongoing growth of medical practice in Langlade County. One of Franklin D. Roosevelt's first and arguably most successful New Deal projects was the establishment of the Civilian Conservation Corps. Nation wide, young men worked at projects that improved the environment. 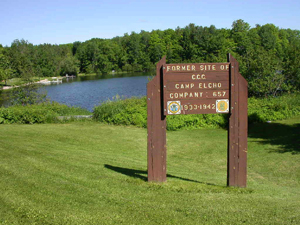 One camp was in Elcho and from 1933 to 1942 recruits planted trees, improved streams and lakes and established forest fire protection infrastructure. what was then the library (now the museum). Francis Deleglise was a Swiss immigrant who returned to his home in Appleton after fighting in the Civil War. He worked as a timber cruiser, exploring north central Wisconsin for its lumber potential. 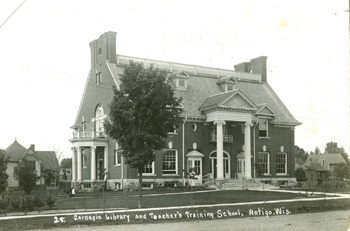 In 1879 he moved his family to a small log cabin in what would become Antigo. The family was important in the growth of the city. A.J. 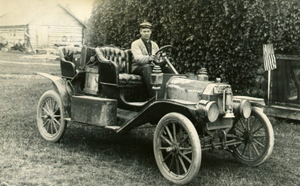 Kingsbury was based in Antigo but traveled extensively throughout northern Wisconsin and the Michigan U.P. He photographed many scenes for his picture post card business. 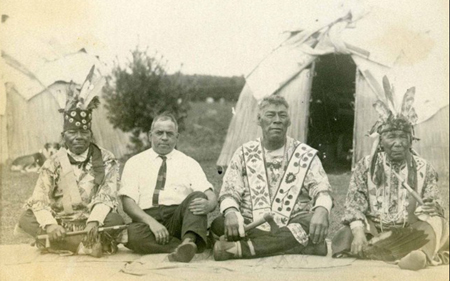 His peak years of activity were the early decades of the 20th century and he documented the lives of local Indians, developing cities, logging camps, the railroad, and a growing tourism industry at a time when major transitions were occurring in the area. The many old barns in the area are a re-minder of the importance of agriculture in the county. 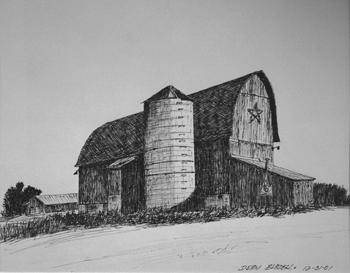 Some of these barns are slowly collapsing but drawings by Dean Blazek have preserved them, at least in memories.